This bowl has been sitting on my kitchen table for more than a few days. 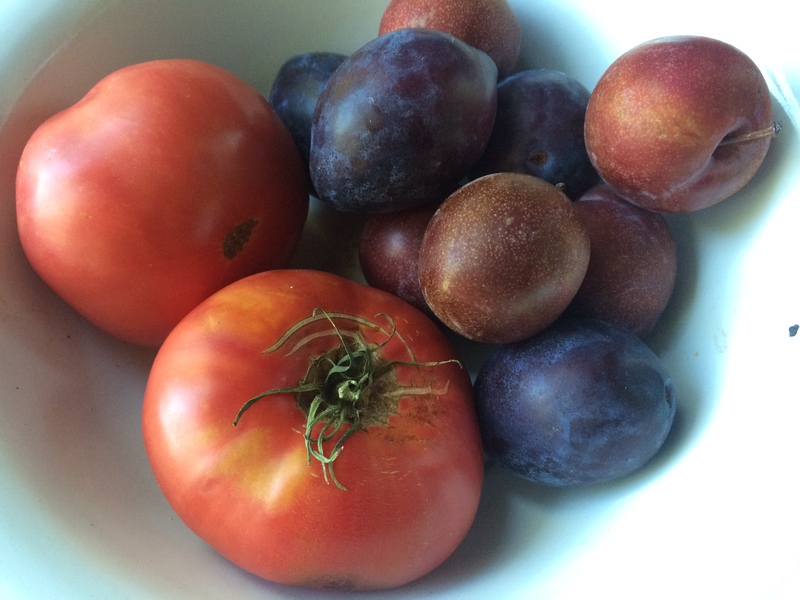 It was haphazard–a few elephant heart plums, Italian prune plums, and some of the last tomatoes from volunteer plants in my garden. I don’t know what kind of tomatoes they were, but they are large and pretty, with a faint tinge of pink. The other day I came close to the bowl and the smell of these fruits together rose up together in a gloriously perfumed way, and I knew this bowl was to become a batch of jam. I’ve been making tomato plum jam for a few years now. Last year’s batch was really special, made with Japanese Black Trifele tomatoes that were incredibly delicious and some prune plums. Tomatoes and plums are such an amazing combination–slightly mysterious because we don’t always expect tomatoes mixed with plums. I’ve been seeing a lot of salads with plums in them, and I can attest that they are amazing together. This salad (above) with Santa Rosa plums and figs mixed with tomatoes and basil was pure summer heaven. I hope you are doing the same before they are all gone! Let the fruit sit with the sugar for several hours to overnight, covered and in a cool spot. The fridge is fine, too. Then boil in a good jam pot until the mixture has become thick and jammy. Process in a boiling water bath for ten minutes or keep in the fridge. I’m trying this one now! Wondering about any cinnamon, or maybe nutmeg? Cardamom? and… I noticed no lemon juice? Do the plums bring in enough acidity to counter the tomatoes? thanks! A year later but I wanted you to know I just made this with 6 lbs. of fruit and it is so good, thank-you. I did use lime instead of lemon and about 1 Tbsp. per lb., but that was adjusted to suit my taste. Thank-you! Thank you so much for letting me know! A year later is just fine. I just had some for breakfast this morning, actually, from this year’s harvest. Glad you liked it too!